All works in this section are available for sale, but may from time to time be included in exhibitions. For current availability please contact the artist. 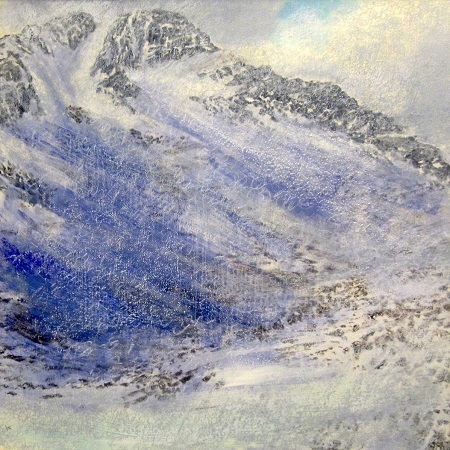 This piece is another of the paintings I have created based on views from Ghlas Bheinn …this time looking towards Achaladair. We’d sat out of the wind eating our lunch and just watching the view change as the snow showers moved through the landscape. I often say to people that I see the landscape very much in terms of pattern. 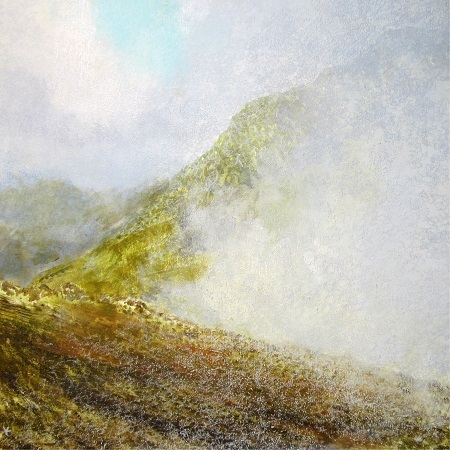 This painting is based on a day we had walking the hills above Glencoe when the broken cloud cover gave a constantly changing patchwork of light, shade and colour. This is definitely one of my more abstract Scottish landscape paintings but I think it captures my memories of the day very well. We’ve walked the summits of Buachaille Etive Beag on several occasions and experienced them in different conditions. On this occasion we were treated to a constantly changing view as thick cloud on the northern side of the hill regularly bubbled up and spilt over the ridge and summit ….before sinking back again. However good a bright clear day in the hills is, it is these more changeable conditions that so often give the best and most exciting views. As much as I like to climb hills in reasonable weather, there are times when you just have to go even if there is a good chance that you’ll see nothing the whole day. When we climbed Beinn Damh at the head of Loch Torridon the other year, this was very much the case. The cloud was very low and not forecast to lift the whole day, but we were on holiday and just wanted to get out. Nothing though, when it comes to Scottish mountain weather can be that exact and as we plodded along the broad stony ridge in thick mist…..everything suddenly changed. Suddenly we could see the summit and our route ahead along the narrowing ridge …it was amazing. We stood there with broad smiles on our faces and watched the scene for five or so minutes before the cloud once again enveloped the hill. We hoped that it might clear again once we were at the summit and we sat in the cool damp murk for almost an hour waiting and hoping ….but the top never cleared during the rest of the day. It was a great walk though and that five minutes when the cloud did clear made it very special indeed. 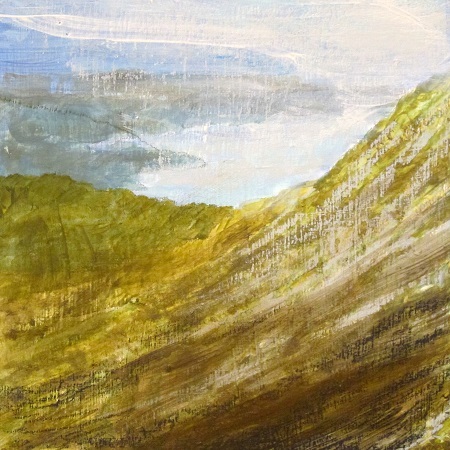 This quite abstract Scottish landscape painting is based on a scene I experienced while out walking in our local North Ayrshire hills ….above Largs. We’d gone out on an exceedingly cold early January day the other year and planned quite a lengthy wander around some of the tops. The snow however was deep and difficult to walk in and we never managed half of what we’d planned. But it didn’t matter as the hills and views out over the Firth of Clyde were spectacular. As we plodded our way back in the late afternoon, the sun dipped out to the west and for a short time the snow covered hills around us turned a rich coppery pink colour. 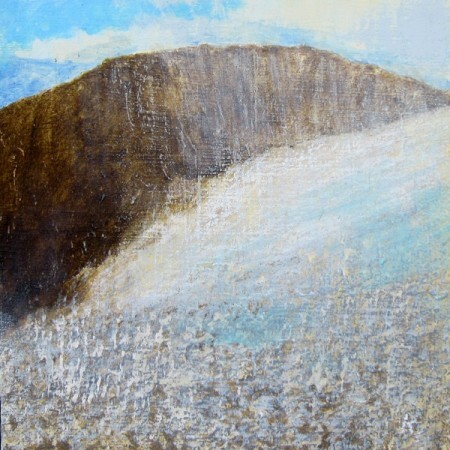 I tried to photograph the scene but the images didn’t do it justice…..so this painting is about my memories of those few minutes standing in the pink snow of the North Ayrshire Hills. 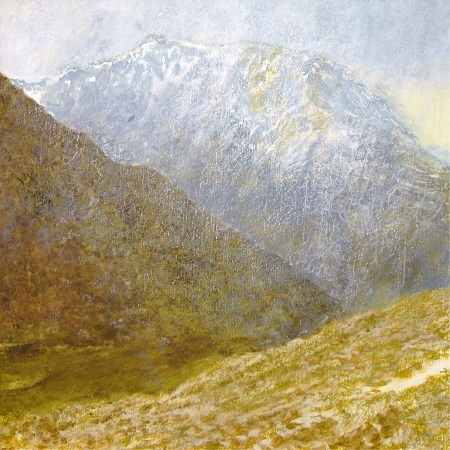 This is another of my Ghlas Bheinn paintings and it shows a view looking from the hill towards the bigger peaks of the Blackmount. The day was so changeable that although we had bright sunshine on occasions, it also snowed periodically and the landscape around us went from bright and colourful, to grey and quite sombre at times. 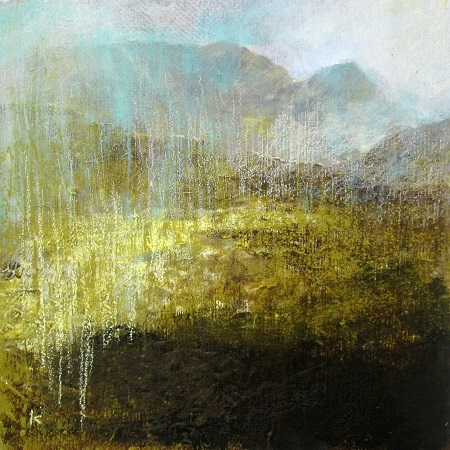 This is the second of my series of 80 x 80 cm canvases based on our walk last year on Canisp, in NW Highlands. 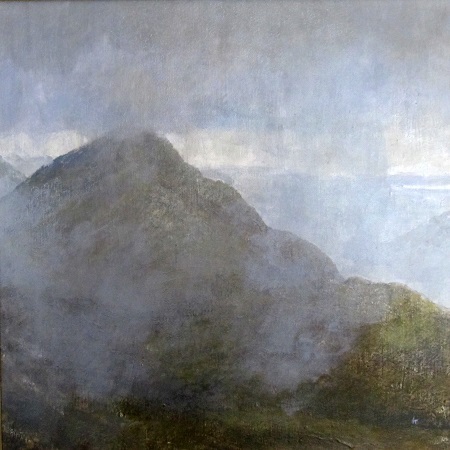 This painting, as with the first piece, was created using broad brush strokes of thick over-lapping oil paint and is based on the view we had as we descended from the ridge down to a small loch nestling below the steep north facing slopes of the hill. As the title implies, the weather was very changeable that day and for short periods there were bursts of sunshine in between increasingly heavy showers. Gael Charn was my 99th Munro and this view looks across the beallach to A’Mharconaich ….shortly to be my 100th Munro summit. This walk took place a good few years ago but the snow covered hills and cold clear air made it a very memorable one. We met just one person that day, a lone figure standing at the beallach enjoying the views across to the Ben Alder group of mountains. 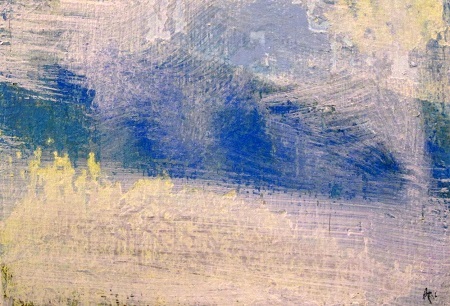 This is a simple little painting but I really like the composition. We re-visited these hills along with their two more southern neighbours the other summer in a long warm day…. these high and at times stony tops and their long connecting ridges make for superb walking ….at any time of year. The two wee hills of Beinn Dubh and Mid Hill that sit on the west side of Loch Lomond above the village of Luss always make for a fine walk. 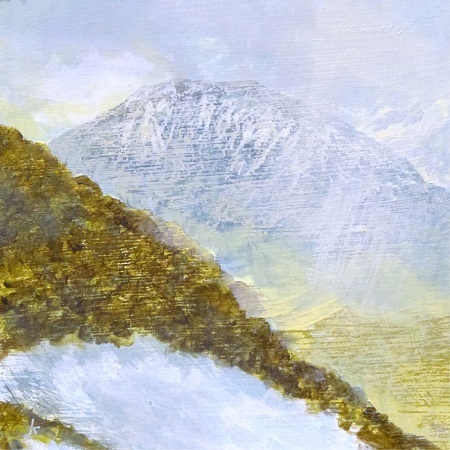 This more abstract little landscape painting is based on a view you see only if you descend from the main path, a short way from the small cairn marking the summit of Beinn Dubh. The steep little gully collects snow and at times there can be a very large drift here and it is well worth the short steep little detour to see it. We visit the area around the Bridge of Orchy quite often and have seen Beinn Dorain and Beinn an Dothaidh, (the two Munros immediately behind the village) in all sorts of conditions. 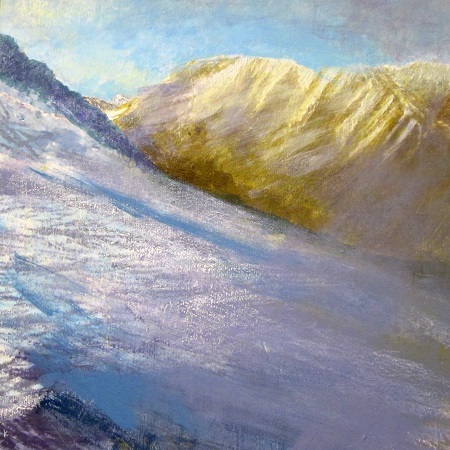 This recent painting tries to capture the colours and atmosphere we experienced the other year on a late winter afternoon as we were returning home after a walk up the near-by hill of Ghlas Bheinn. As the sun dipped in the west, the slopes of these two big mountains turn very briefly, a very deep shade of red. It was quite a sight and this is the second painting I’ve completed based on this view. Price: £2500 including P&P in UK. 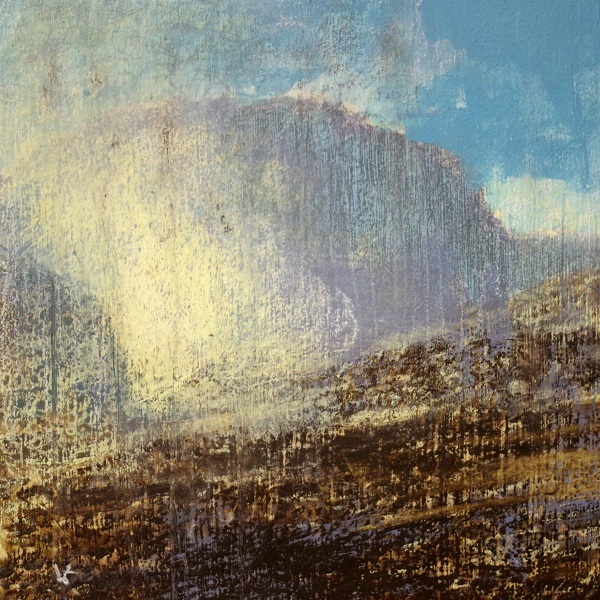 I completed this painting last summer, just a few months after we’d done a magnificent circular walk over Canisp in Assynt. The weather really wasn’t the best but we did experience some amazing conditions and views that day, although the high winds prevented us from reaching the summit alas. It’s a very wild and ancient landscape surrounding this hill with huge areas of broken boulders, bare rock and rough grass and heather. After descending from the broad ridge of the hill, we were caught in some really heavy and quite violent hail showers. This piece is painted in traditional oil colour using thick paint applied with a very large horse hair house painting brush. Lochnagar is one of the hills I had wanted to climb for many years. Its location though, meant that it was just too far for us to visit as a day trip from Irvine and so the years went by without us reaching it. In the spring of 2014 however, we got a glimpse of it while walking the hills to the immediate east of Glen Shee and we took the decision there and then to buy a small tent so that we could finally go and climb the hill. 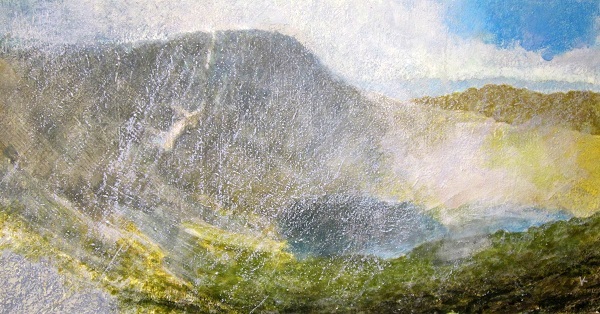 This painting is based on the view we had looking out across the huge corrie as we made our way up onto the plateau. It may have taken a lot of years to get there, but it was well worth the wait. This is another of my new oil paintings and it is one that I am particularly pleased with. As you may know, Nita and I visit a small hill called Ghlas Bheinn every winter for a short but spectacular walk. This small hill is based on the edge of Rannoch Moor and is surrounded on all other sides by impressive mountains. Ghlas Bheinn is a perfect view point with 360degree views. When we were there last February it was looking really impressive in rapidly changing conditions. 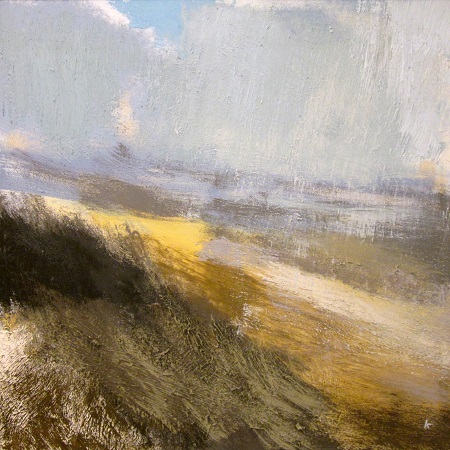 At times there was bright sunshine illuminating the rich winter colours of the moor and hillsides while at other times the views were shrouded in driving snow as big showers blasted their way through the landscape. 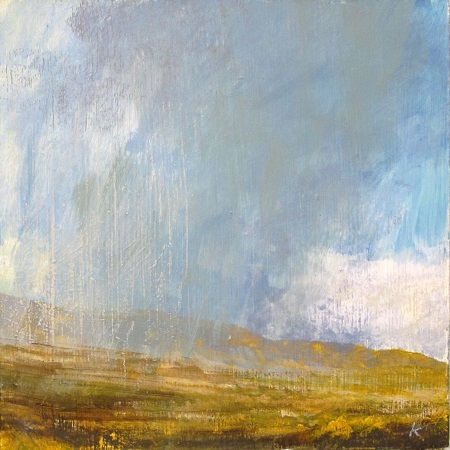 I think this painting well captures the scene as one of these heavy showers moved towards us. As anyone who reads my blogs will know, we walk bits of the West Highland Way quite regularly…..usually to get to or back from a hill. I’m hoping this year to put together a series of images of paintings based on views from, or above this famous long distance path. I have a number of works already completed, images of which could be included and this painting is one of them. 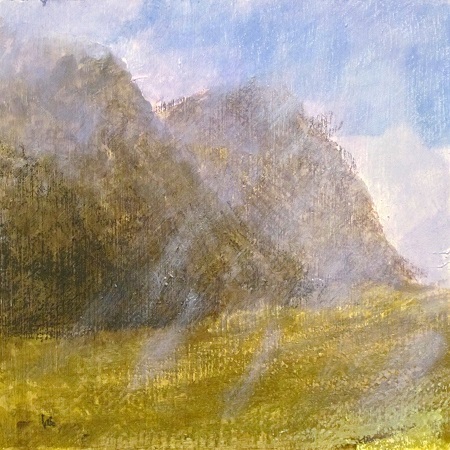 It is based on a view we had as we were walking back along the WHW between Ba Cottage and the Glencoe ski centre. We had been walking the hills to the west of the path and were at the end of what had been a long day when we saw this heavy shower moving towards us across the edge of Rannoch Moor. Walking roughly north along the ridge from the top of the Devil’s Staircase on the West Highland Way, takes you after several intermediate summits, to Am Bodach at the start of the famous Aonach Eagach where walking turns into difficult scrambling! 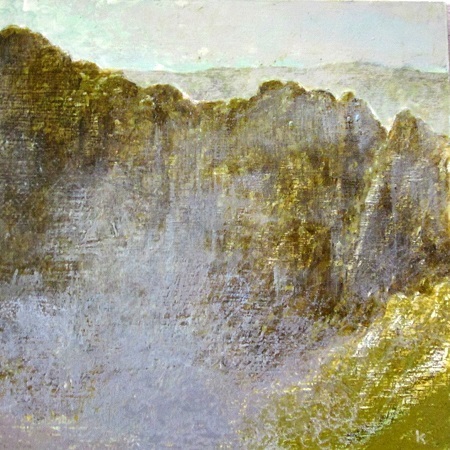 This small painting is based on a view we had the other spring as we wandered along the easy bit. That said, the views are spectacular with all the Glencoe mountains close by and further off, fine views to the Mamores and Ben Nevis. This was one of the first of my new oil paintings and was completed about eighteen months ago in 2014. Like the more recent pieces, it was created using thick oil paint dragged into place using an old horse hair house painting brush. 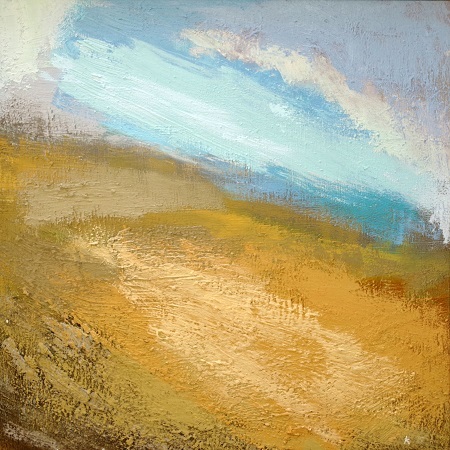 The coarse nature of the brush gives the paint a much textured surface which I particularly like in this more abstract landscape painting. 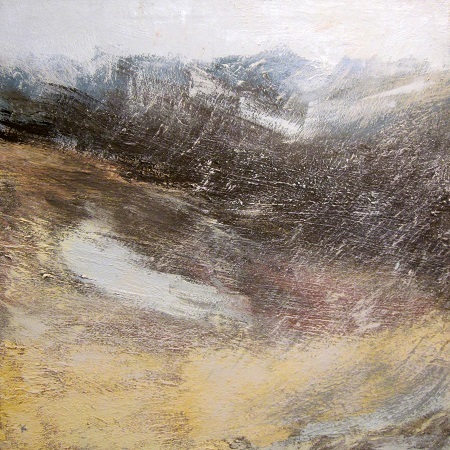 The composition is roughly based on the view you get when looking across to the mountains of the Blackmount and in particular, the huge snow covered slopes of Clach Lethaidh. 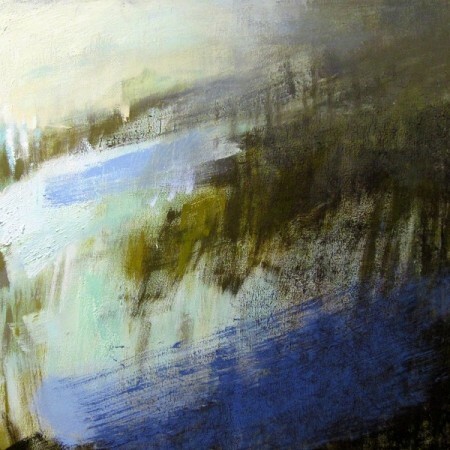 This is a bold and quite striking piece that looks particularly good on a big wall with some space around it. Most people experience the eastern shores of Loch Lomond from the magnificent West Highland Way long distance footpath. The view point for this painting however is a good couple of hundred metres above the footpath on a broad track that zigzags its way up the steep hillside. We had been on a trip to walk the lonely little summit of Chuirn a’ Bheinn that rises a few kilometres to the north of Beinn Lomond. It had been a strange day of heavy brooding clouds that made the famous Munro look especially good. As we descended back to the loch side the sun started to emerge through the banks of mist and for a while we had these very atmospheric views over the famous loch. Mam na Gualainn is situated in an amazing location. It rises on the north side of Loch Leven and has spectacular views south to the mountains of Glen Coe and north to the Mamores and Ben Nevis. I did this painting after visiting the hill the other summer. It was a very strange day of weather, with low cloud rolling in from the west and then breaking around the mountains. For much of the day we actually had bright sun but every now and again it came over very heavy and threatened but didn’t actually rain. 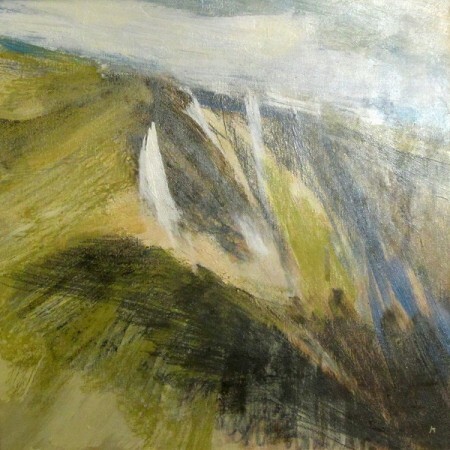 This painting is based on just one such moment and it made for a very dramatic view along the length of the hill and east to the Blackwater Reservoir. During the course of our two week long holiday on Harris in 2013, we had many days of rain, high winds and one even of snow. We did however catch a couple of fine cold days and on one of these we drove south down the west coast of the island. The beaches and coastal scenery was superb and I did a number of paintings trying to record this wild beautiful coast-line. 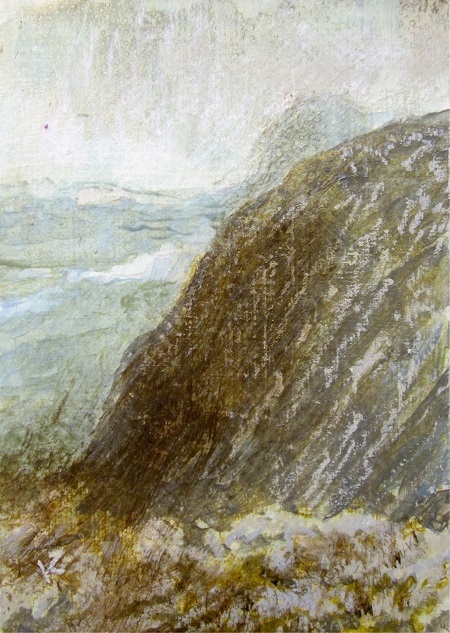 This painting is one of them and it was done using thick layers of oil colour to capture the movement and power of the Atlantic Ocean as it crashed against this remote island. Price: £1120 including P&P in UK. This painting is supplied unframed and will be shipped, rolled. The title of this piece says everything really! This was the start of what was to be a very drich couple of weeks on Harris. We were sat in the cafe onboard the ferry from Uig to Tarbet, eating chips and supping a beer and looking out over the choppy seas. It was misty and damp and we were looking for our first sight of the islands. As I sat there I suddenly realised that the scene before me would make an excellent graphite drawing and I started this large piece on the dining table of the wee cottage we’d rented for the holiday. 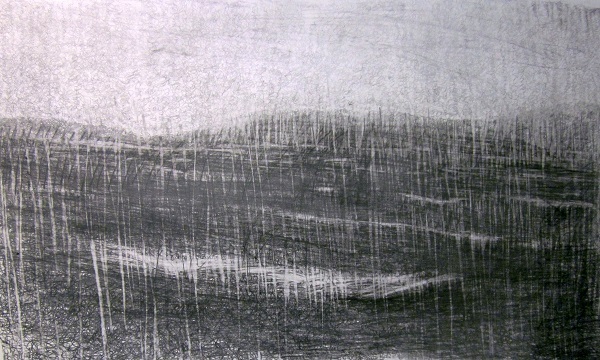 I’ve done a good number of these quite large graphite drawings ….but I think that this is my favourite. 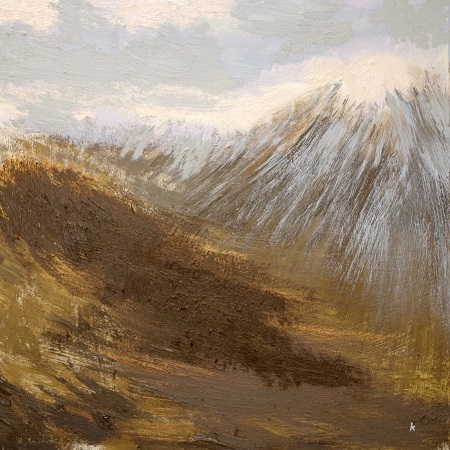 I did this painting a few years ago after a wonderful walk up in the Drumochter Hills. It was actually the day we reached the summit of our 100th Munro and to do this on a perfect late winter day made it very special. The upper slopes of the hills were still well covered in snow and ice but further down this was melting back to create large patches of white against the sunlit hillside and glen below. 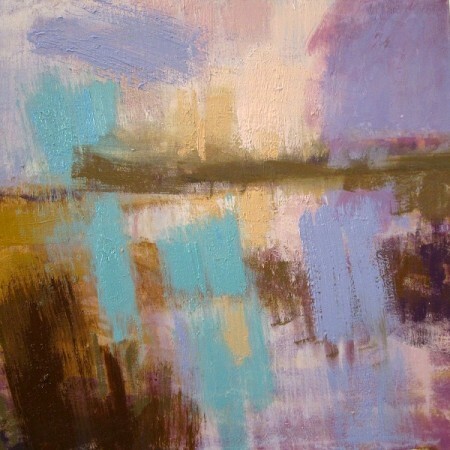 It was an amazing patchwork of light and colour and I’ve tried to capture something of it in this painting. Price: £695 including P&P in UK. This drawing is supplied mounted but not framed. 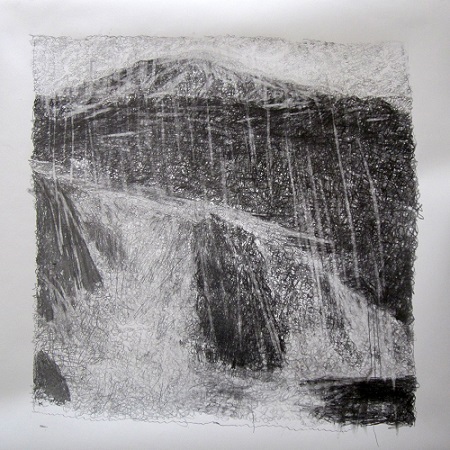 This was one of a number of drawings I did after our two week long stay on Harris back in May 2013. It was officially our “summer” holiday but the weather had other ideas! Amidst the many days of rain and high winds, we also had a day of snow! 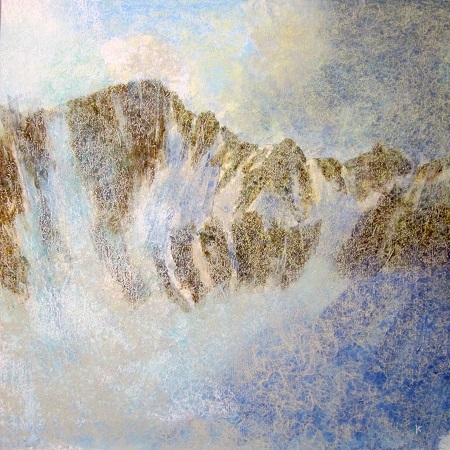 This drawing was based on a view we had while walking in the hills the day after the snowfall. The snow was thawing quickly and this stream was in spate…..the patterns of the white water against the rocks mimicking the patterns of the snow against the crags on the hills behind. 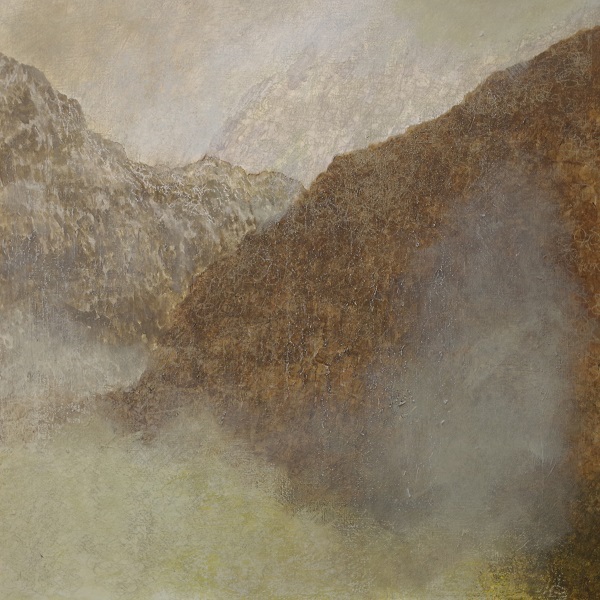 This large painting is based on one of the many classic views seen as you drive down the A82 through Glen Coe. 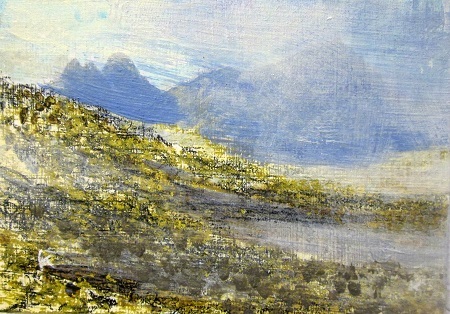 As you know, most of my work is based on views from up high in the hills or well away from the roads. On this occasion though I just couldn’t resist the temptation to create a painting from this view point…..with clouds breaking around this fabulous mountain. A few years ago while we were walking in the hills on the Isle of Arran we sat for almost an hour watching what had been thick cloud all around us, slowly break up and lift. To start with we’d just noticed that it was generally getting brighter and then we spotted the very top of Beinn Nuis appearing out of the cloud. Over the next hour we watched the most wonderful changing views of mountain and cloud before the hills finally cleared completely. This painting tries to capture something of this time. We never got to the summit of our hill …we’d spent too much time sitting and looking. It didn’t matter though ….this is what walking in the hills is all about. Assynt has really caught our attention over the last 10 years. We’ve had five holidays there and will no doubt go back again soon. The landscape really is very special and the views are exceptional. 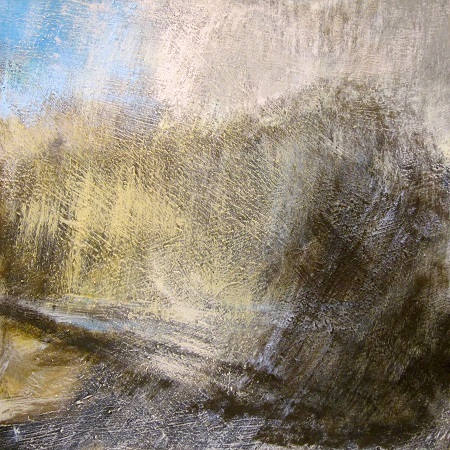 This little painting is based on a day we walk Braebag, a long stone covered whale-back of a hill near Conival. From its broad slopes you see across to Suilven and Canisp. On this particular day we had a mix of sun and rain showers, making the views even more atmospheric. In late April this year we took our first ever trip over to Harris. We’d had a great drive up to Uig on the Isle of Skye in fine spring weather but as we waited for the evening ferry to arrive, the sky filled in and by the time we were on board and under way it was grey, damp and quite windy. We sat looking out through the salt spray covered windows watching the waves and waiting to get our first sight of the outer isles. The scene seemed perfect for some drawings and paintings and this is the first piece I completed. A lady who saw this painting at my studio the other month and who was born on Lewis said that all it needed was the smell of peat fires. She said her father always knew when the ferry was getting close to the isles because of the smell of the peat fires in the air. We visit the Isle of Arran once or twice each year and it never ceases to amaze me how spectacular a place it is. 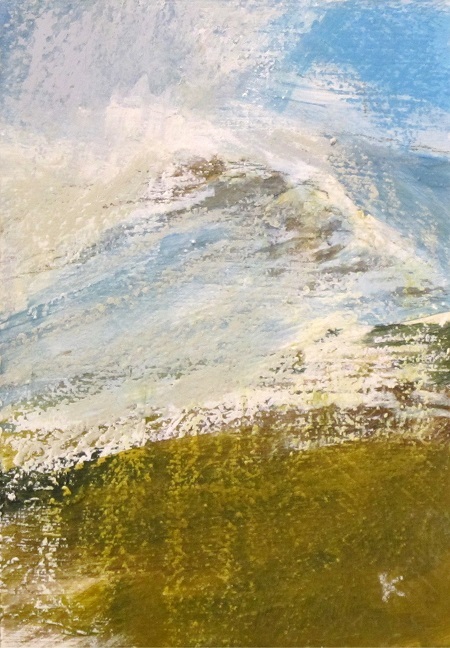 This small scene was based on a day we spent walking on Goat Fell when there was patchy low cloud drifting up Glen Rosa and then breaking over The Saddle into Glen Sannox. Although it often shrouded Cir Mhor, the Witches Step and the other main Arran peaks, strangely it never filled in completely at the summit of Goat Fell …the highest peak on Arran. Although much of the time we spent on Harris this year was wet, we did have several very fine days. On one of these we spent the day visiting some of the wonderful beaches on the west coast of the island. 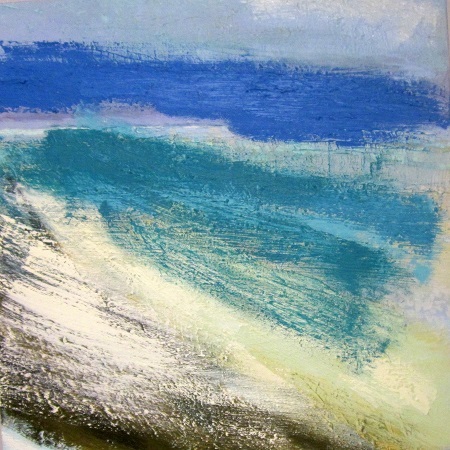 This slightly abstract piece is one of several paintings I’ve completed based on these fabulous beaches. 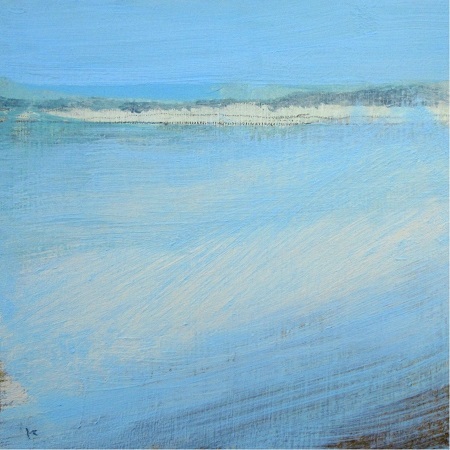 This is another of the Harris beach paintings, this time a more traditional view at near high tide. The waters around these wild islands on the edge of the Atlantic are so clean and clear they create magnificent colours as they pour over the pale sands. 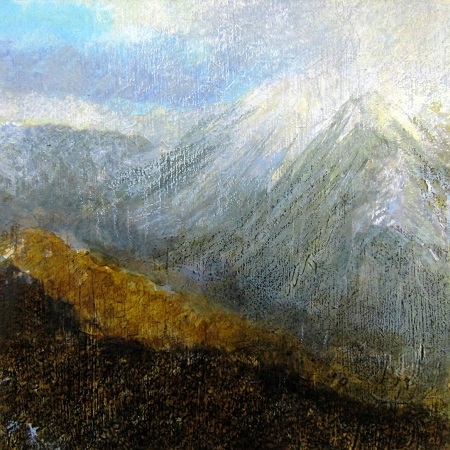 This is the latest painting I’ve created based on a trip we did to Ben Lui on a cold early spring day several years ago. It was a day of occasional flurries of snow and varying light and it made a very dramatic scene. There is a walk we do most years in December that follows the line of low, heather, grass and rock covered ridge on the edge of Rannoch Moor. The highest point is a little less than 600 m but as a view point it might be difficult to find better in the area …even from some of the larger neighbouring peaks. 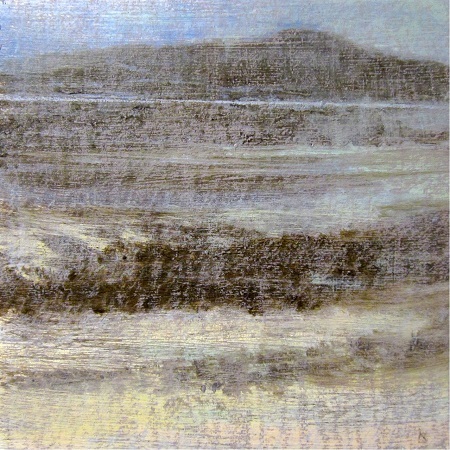 This painting was based on one of the views I had as I looked across the edge of the moor to some of the large snow topped hills of the Blackmount. 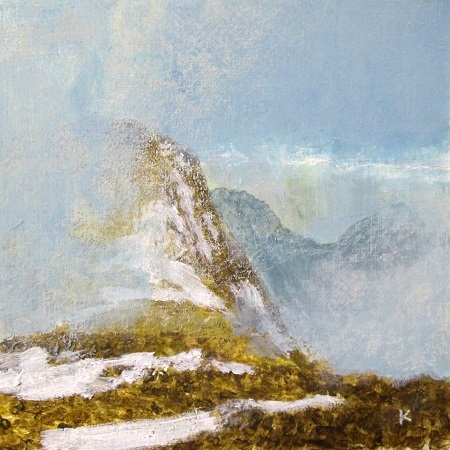 I did this small painting after a very snowy day up near Glencoe. We’d planned to walk up the West Highland Way to the top of the Devils Staircase and then head north up onto the tops. However, the snow was much deeper than we’d expected and it took much longer to reach the high point on the WHW with snow at times well above our knees. In the end we admitted defeat and just enjoyed the spectacular views all around. 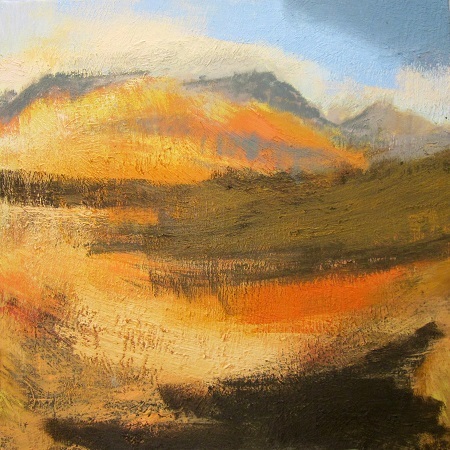 This rather abstract little piece tries to capture the view across the moor towards the mountains of Blackmount and Glencoe. I like this little painting and it brings back a lot of memories. Low, late sunlight breaking through heavy clouds onto the open hillside can make for a dramatic scene. We had just such conditions early this year as we walked back down Cononish Glen from Ben Lui. My fuzzy eye makes things even more dramatic at times like this! We had a lot of rain when we were staying on Harris in early May this year and this was a scene we witnessed on several occasions as we drove the road through the mountains there. Most of the scenes I paint are viewpoints up in the hills and glens and I rarely try and work scenes seen from the roadside …but this was an exception ….one that was well worth making I think! This is another of the coastal scenes I painted following our visit to Harris in early May. This was much more like we saw the coastal landscape most of the holiday …grey and damp but with much atmosphere and incredible wildness. We spent a good deal of time splashing over wet sand, peering into rock pools and listening to the sounds of the waves, wind and birds …if you can’t be on the hill because of the weather then this is a great alternative! Price: Framed £750, Unframed £685. Contact the artist for current availability. Arkle is one of a number of magnificent mountains located in the far north west of Scotland. Rising above Loch Stack its upper slopes are covered in very light coloured quartzite screes that sine brightly when caught by the sun. We walked up to the southern summit of the hill in May 2011 and although the cloud was high, there was a real gale blowing and it made for hard work walking over the loose and rough screes. Ben Loyal is a stunning mountain situated on the northern coast of Sutherland. On our recent holiday there in May this year we decided to try and climb it. It’s quite a long walk in to the base of the hill and then a steep pull up to the broad ridge. As we got to the top of the steep ground the weather that had until then been fine, quickly deteriorated and within a few minutes the snow was falling and the cloud descended. It was quite magnificent watching the big snow flakes and as I stood there I remember thinking that this scene would make a good painting. Hopefully this is it! Price: £1250 framed. £1150 unframed. (contact the artist for availability). This painting is currently available direct from the studio and is supplied with a mount but is not framed. Please contact the artist for an amended price if you would like it framed. You only have to gain a little height in the Flow Country to get huge views. This was the case as soon as we started climbing the gentle lower slopes of Beinn Griam Beg. When it wasn’t snowing it made you realise just how big, wild and remote this region is. …when it was snowing it made you realise just how small and isolated you were! This is another of my new ‘Sutherland’ paintings. This is based on the views we had as we were walking towards the base of Beinn Griam Beg, a modest hill of just under 600m that rises from the expanse of the Flow Country. Conditions were very varied and bright sunshine would quickly turn to driving snow and mist …the hills we were walking towards rapidly disappearing only to reappear half an hour later with a slightly white coating. This painting is currently available direct from the studio and is supplied with a mount but is not framed. Please contact the artist for an amended price if you would like it framed. 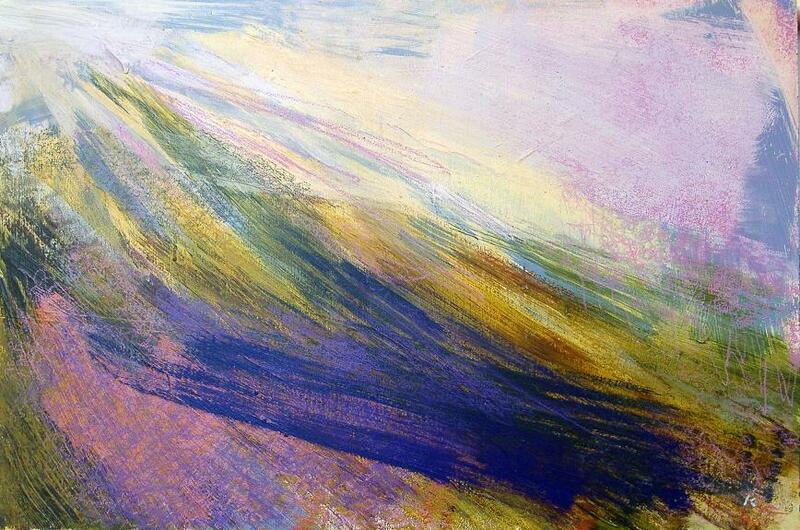 This is one of my latest paintings created since we returned from Sutherland in mid May 2012. It is a view looking north from the steep slopes leading up to the summit ridge of Ben Loyal in Sutherland. After a bright start conditions had gradually deteriorated and this was the point that the snow started falling and the cloud started to descend….2 or 3 minutes later the views were gone and we were stood in mist and driving snow! That’s a real summer holiday for you! Price: £2500 framed; £2350 unframed. (Contact the artist for availability). We’ve driven across the edge of Rannoch Moor on many occasions and have seen it under a variety of conditions. 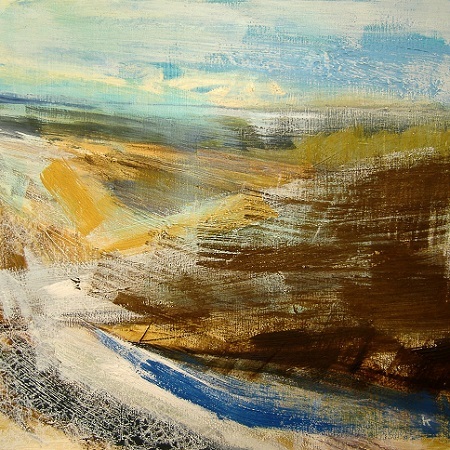 This painting tries to capture a little of the mood and changing colour of this wild landscape. 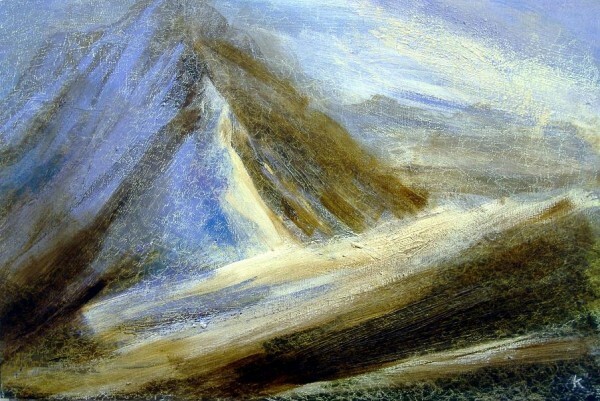 It was painted using large broad brushes and thick paint put down in broad strokes. 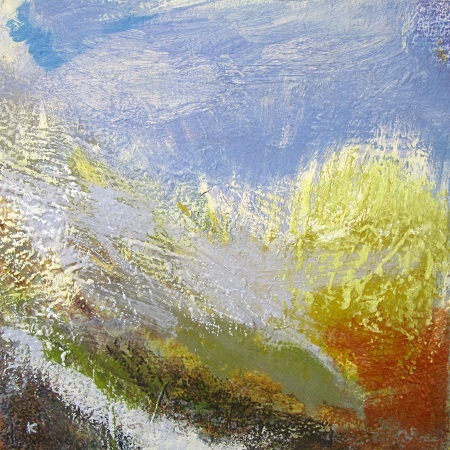 It is a little different from many of my paintings but I’ve enjoyed experimenting with the paint and textures and have thoroughly enjoyed working in this way. This is one of my new oil paintings. 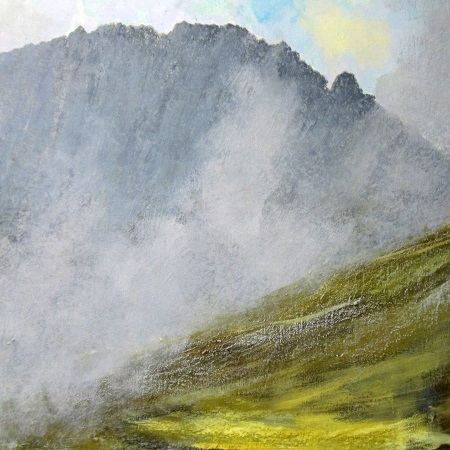 This piece is based on my memories of a wild day walking on Beinn Chonzie several years ago. As we approached the summit the conditions started to become very bad with heavy rain, cloud and increasingly severe gales. We decided it wasn’t worth going to the top but stopped briefly for lunch, sheltering as best we could on the steep southern slopes where patches of old snow were rapidly melting. It was wild and unfriendly weather and we did not feel welcome ….it was time to head down taking with us our wet gear and a rucksack full of memories. 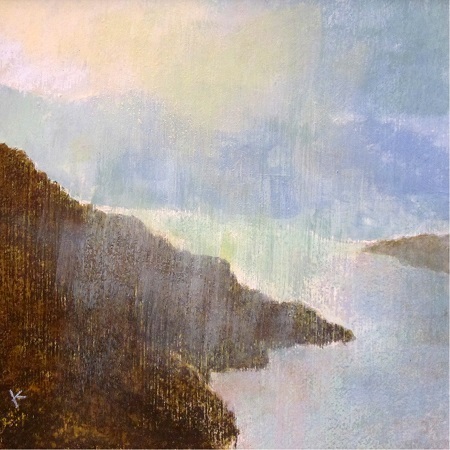 This painting is mounted and framed behind glass with a simple but stylish white gesso frame. 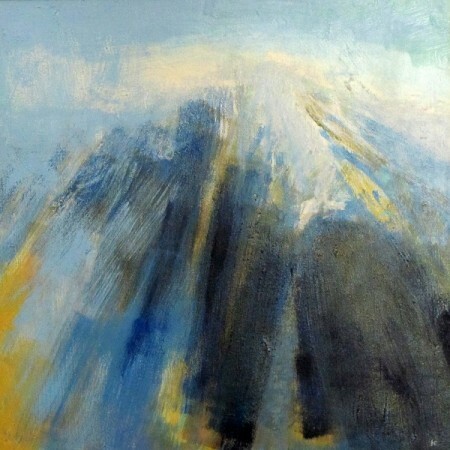 It can also be supplied with a mount only – please contact the artist for a revised price. A couple of years ago we had a fine day walking the two summits of Buachaille Etive Beag in Glen Coe. It was cloudy as we made our way up to Stob Dubh at the south west end of the hill, but as we sat at its summit, the cloud occasionally broke giving views towards Glen Etive and the head of the loch. On starting to retrace our steps down the short steep section below the summit, the cloud once again broke around us. This time clearing to the east side but remaining thick to the west. It only stayed like this for a short time before filling in again and I took no photos. This painting is then, very much about my memory from the day. Hopefully it captures a little of this amazing place. Price: Framed £2500, Unframed £2350. Contact artist for current availability. This painting is framed without glass in a simple but stylish 11cm wide pale cream coloured wooden frame. 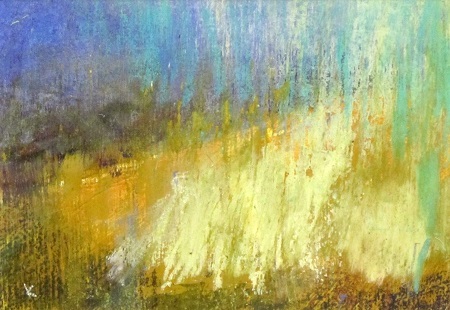 It can also be supplied without a frame – please contact the artist for a revised price. This is the latest of four paintings I’ve completed on this theme. The view is from the upper slopes of Conival, (one of the two Assynt Munros) and looks out over the large expanse of wild rocky country to thenorth westof the mountain. 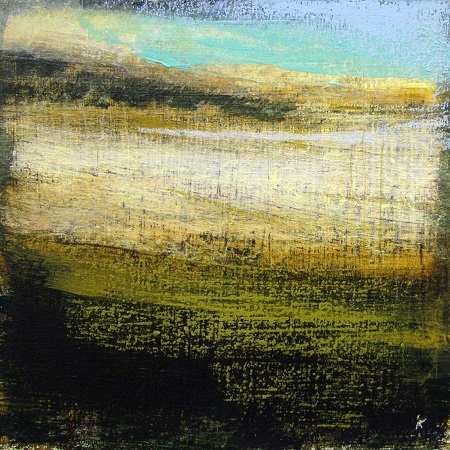 On this occasion it was a spring day, the landscape looked like a patchwork of textures, colour and line made up by the combination of rock, grass, snow and shadow. This painting tries to explore these patterns and textures and is created using large bold brush strokes and in places quite thick paint. 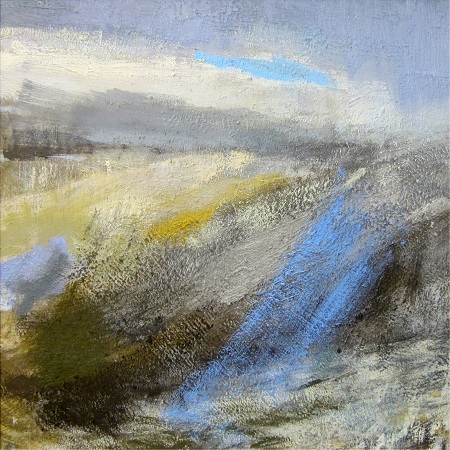 This painting is based on a very cold day I spent with my mate Guy the other year on the hills to the east of Drumochter Pass. Once you’ve hauled yourself up the steep flanks of these hills from the road, it’s a high, bleak and very wild area of undulating moor. Two of the higher bumps are classified as Munros and lie I guess, about four miles apart. We walked the two ‘hills’ on a layer of snow that held your weight for an instant….and then gave way as you transferred your weight! It was very hard work especially as we were walking for much of the day into a very strong and bitterly cold wind. We were both exhausted by the time we got back to the car in the last light of the day and we both agreed that we might not return to these two hills ….but strangely enough we do both remember this very tiring day….it was a bit of an epic! This painting is framed without glass in a simple but stylish 11cm wide pale cream coloured wooden frame. 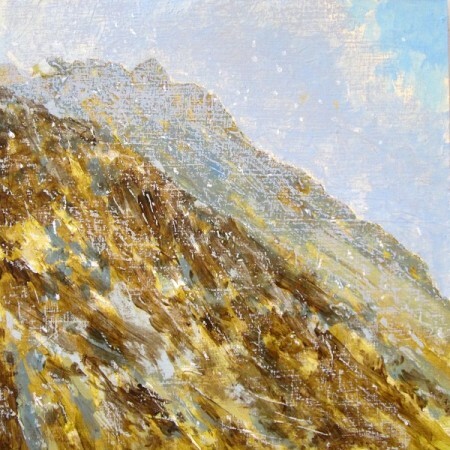 This is one of my new 80 x 80 cm paintings and is based on a day when we watched cloud break off of the summit of a snow topped Beinn Toaig. Painted with broad brush strokes this bold almost abstract piece does none the less well convey this very Scottish scene. After scrambling the very steep lower slopes on theeast ridgeof Ben Lui, we reached this almost level section. The mountain rose steeply again but the views on this wintry April afternoon were quite stunning. Occasional breaks in the thick cloud brought with them patches of light and colour that made the scene even more dramatic. This painting is mounted and framed behind glass with a simple but stylish 7cm wide ‘York’ silver frame. The hills that rise around Loch Turret in Perthshire give superb views out over the lower countryside around Crieff. We’d walked a kilometre or so off the main route up Ben Chonzie, to reach an un-named little top. A small pile of stones marked the point, and the fact that others too made the short detour to see these fine views. Beinn Odhar is a steep sided and mainly grassy hill that rises to just over 900m on the outskirts of Tyndrum. From its summit yoou can look across the Auch Gleanne to its bigger neighbours Beinn Dorain and Beinn an Dothaidh. topped hills all around look particularly good. A beautiful mid December day led to this and several other paintings. On this occasion we had done a relatively short walk up onto the wee top of Ghlas Beinn. It is only something over 500 m but it is right on the edge of Rannoch Moor and gives huge views to all points on the compass. Coupled with this we had dramatic skies, bright sunshine and the first snows on the high tops of the Blackmount and Glencoe …well, it was just stunning and made for a very memorable day. 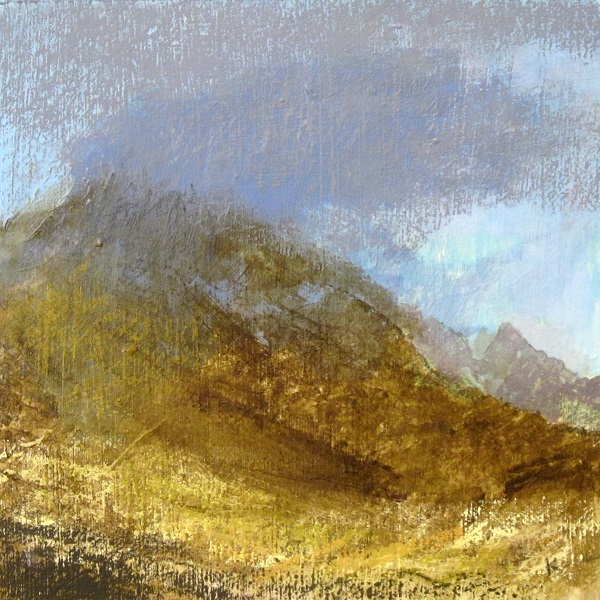 This is another of my Rannoch Moor paintings and was I think the first one in which I used copper and gold paints. The colours of the winter grasses and vegetation were extremely bright in the sunshine that day and I wanted to try and capture something of this. 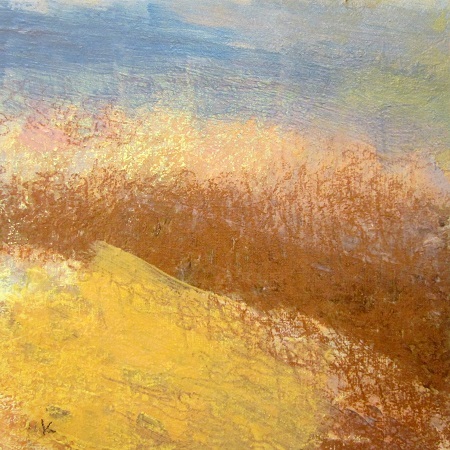 I have not use the copper and gold paint directly but mixed them with other colours to give a more subtle effect. Framed without glass in a simple cream coloured wooden frame. The walk around Beinn Dubh and Mid Hill above Luss is one of my favourites. The hills aren’t huge but they are steep and in winter can offer a surprisingly challenging few hours. 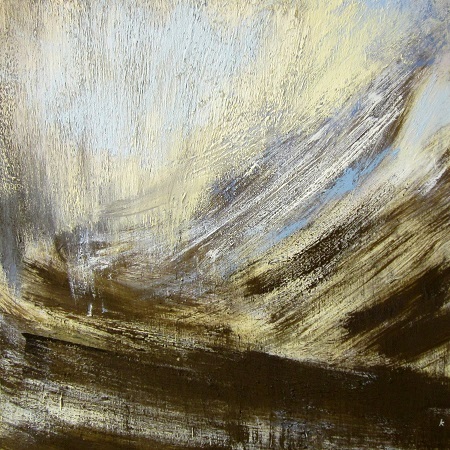 This painting is based on just such a day, when on the tops the wind was gusting 50 mph with a wind chill of around -20C and in the shelter of the glen …it was more like spring. What the difference a few hundred metres can make. This painting is framed with out glass in a simple cream coloured wooden frame. Beinn Dorain is the fine hill that rises above Bridge of Orchy and the A82. I’d climbed it twice before and on both occasions never saw a thing – the whole of the summit being well shrouded in thick mist. On my third attempt at getting a view I was lucky. It was a fabulous February day with large patches of icy snow and to the south-east a partial temperature inversion with the peaks of Ben Lui and Ben Lomand appearing through the cloud. This was a mid week day and we only saw one other person …the perfect spot to have lunch and sit and take in the quietness and beauty of the location.